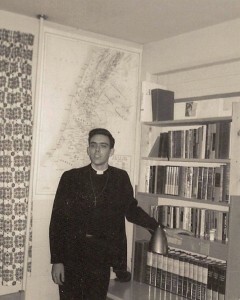 Here I am in my dorm room at Indiana University in the early 60s—not long before I left to attend seminary, the Boston University School of Theology. What was I thinking? How did the author make the transition from Indiana-bred Christian to atheist author, advocate and activist? The seeds of scriptural study were planted by my devout mother, who was conservative, though not fundamentalist. She introduced me to a massive set of books (12 volumes) called The Interpreter’s Bible, a product of liberal Protestant scholarship. And I was never discouraged from asking questions. My faith remained fairly secure until I headed from college to graduate school, Boston University School of Theology. I was the contrarian seminarian who felt that academic honesty and objectivity were violated by the raison d’etre of seminary: to maintain a shield again penetrating questions about God; the seminary existed to manufacture clergy. My faith eroded gradually, ironically enough because of seminary course content: some questions were unavoidable. I wrote a cheeky essay, “On the Improbability of God,” and a personal doctrinal statement for ordination that demonstrated my capacity for generating theological white noise. That I was approved for ordination remains a mystery. My status as an atheist—and a gay atheist at that—compelled me to build a career on another foundation. The Preface is 16 pages long. These books are representative of the atheist publishing boom of the last decade and a half: more than 125 titles. While atheism may seem to be out loud and in-your-face more than ever before, British and American atheism has been well alive and well, and some of these antecedents are traced in this chapter (e.g., Percy Shelley, Bertrand Russell, Robert Ingersoll, Mark Twain, H. L. Menken). These foundations have culminated in the atheist publishing boom that got under way in the 1990s. It appears to remain robust (about 125 titles so far), and a prominent element of it will be the writings of ex-clergy atheists. The online support group for atheist clergy who have escaped (or are in the process) is called The Clergy Project; there are now more than 500 members. 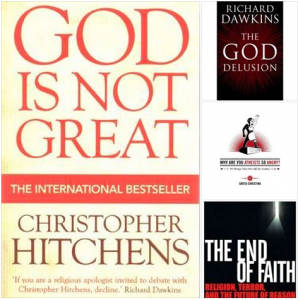 Books written by these people will remain a niche, a sub-genre of atheist writing. An article that I might one day base on this chapter will be titled, “Easy Acceptance of the Very Terrible.” No matter the catastrophe or human calamity that we ask Christians to explain—if a good God is in charge of the world (“He’s Got the Whole World In His Hands”)—we usually hear a litany of excuses. In the interest of holding on to their trust in God, very terribly things are rationalized, e.g., the Black Plague, the Holocaust, the 2004 tsunami. In fact, with the help of professional apologists employed by the churches, laypeople have learned the litany of excuses: God is testing or punishing us, God’s hands are tied by the realities of free will, we are too small to grasp God’s master plan, God is mysterious beyond our understanding. But laypeople are sometimes pushed to the edge—they begin to flirt with disbelief—because very terrible events happen close to home. Thus I begin this chapter with the horrendous school shooting in Connecticut in December 2012. All of the excuses suddenly become shallow; God’s inaction is startling. It just won’t do to let God off the hook. At such moments, even some of the most devout people know in their gut that the problem of evil undermines good-God piety. I tackle a few of the excuses that apologists have test driven for centuries and that believers commonly trot out to show that God is good after all. But laypeople do not realize that all of these excuses have been vetted and found wanting by serious thinkers outside of theological academia. The chapter shows that the excuses for evil and suffering don’t work. This primary obstacle to theism—the existence of massive suffering and evil—is indeed painfully valid. RECAP OF PROBLEM 1: God is perfect love, topped off with omnipotence and omniscience, and he is aware of everything that happens in this world. Not even your innermost thoughts escape his notice. Yet the magnitudes of evil and suffering on this planet aren’t his fault: God gets a free pass. Yes, he’s in change, and we must give him credit and praise for everything good that happens, but we can’t blame him for anything. And we are obliged to accept all the excuses that theologians, priests and preachers invent to deflect suspicion that God isn’t all he’s cracked up to be. Who can’t see through that? How Do You Find Out About God? Is God all in the mind? When I am in an ornery, confrontational mood, I might ask a confident missionary-mode Christian: “What is your epistemology?” But the word is not in the common vocabulary—I usually get a blank stare—so this approach rarely does much good. The issue must be addressed, however: how do you know what you know? And the purpose of this chapter is to demonstrate that the ways of knowing God, those that are commonly assumed to be valid, do not hold up against common sense tests of due diligence. Prayers, revelations, visions, testimonies from holy people, personal feelings (“I know it in my heart”), scriptures—all of these are usually accepted as legitimate ways to know God and discover his will. But Jews, Muslims, Christians and Mormons have used their inside tracks to God to validate enormously different ideas about God. Thus we can be pretty sure that human imagination is the engine driving all of them. “Reality,” a therapist friend once reminded me, “is what goes on outside the patient’s head.” The purpose of this chapter is to show that the universally attested ways to know God are not testable and are highly suspect; they should not be accepted uncritically. Christians fail to do due diligence, indeed they fail to see the need to do so. Recap of Problem 2: God communicates to humans through prayer, visions, meditations, revelations, and intense human emotions. But strangely enough, these channels work only for people who already believe in him. For outsiders, those who would welcome confirmation that God exists and wants to talk to the human species, there has never been a clear, unambiguous message from the divine realm that everyone can agree on. Never mind that religious people themselves have never been able to agree on what God has communicated. Yet we are asked to believe that visions, mediations, revelations and such really have God behind them—and that the sincerity of believers guarantees them all. The Bible is not the ‘good book’ at all. In fact, it’s a pretty bad book. 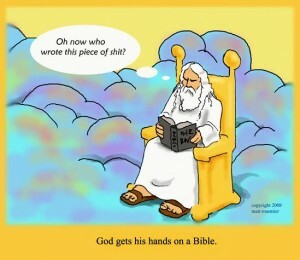 Did God actually write a book? Or at least inspire, in some direct and incorruptible way, the human authors who put pen to paper to create scripture? 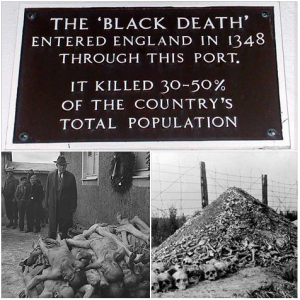 The major religions of the West claim that this happened. Since my expertise is Christianity, I focus on the version of this claim advanced historically by the church. And the purpose of this chapter is to expose the fallacy of “holy writ.” It’s actually pretty easy to do this, since Christians deny that the process worked accurately for the Quran or the Book of Mormon (especially the latter, since almost everyone ridicules the very idea of Joseph Smith’s Golden Plates). They even confess that God didn’t get it quite right with the Old Testament, since a New Testament was needed as an improvement. But it’s also pretty easy to do because, and at every step of the process—the process by which we ended up with the Bible—there are too many highly implausible elements: that is, most reasonable folks acknowledge the unwarranted assumptions and fallacies. I discuss these under the categories that I call The Five Flaws. 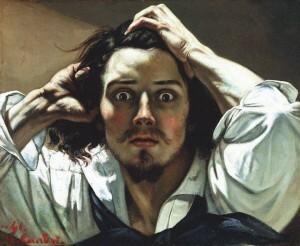 It’s hard for Christian not to feel themselves painted into a corner when the five flaws are pointed out. My goal is accomplished when people admit that the Bible doesn’t deserve its place on a pedestal. In fact, for the last couple of centuries many brands of Christians have been backpedaling: “Oh, that passage is a metaphor,” or “Oh, you can’t take that literally.” This is clearly true, but in fact is a concession that the five flaws must be acknowledged. God has given his perfect message for humanity in book form, but he had to keep adding installments, first the Hebrew Bible, then the New Testament, followed by the Quran and finally the Book of Mormon. But Jews, Christians, Muslims and Mormons can’t agree on which installment is the purest form of God’s word, in fact they commonly reject the other installments, and have come to blows to defend their sacred books. And they pile on tons of slick excuses to explain away countless errors, contractions and moral horrors in these books. It is impossible to make sense of the God idea, as so commonly preached and believed. If we hold concepts of God in separate compartments, in isolation they may seem to hold some merit. ‘God is love’ is a cherished belief, but how does that work out in real life? Especially when ‘God is powerful’ is claimed in the same breath. The parents of the massacred Connecticut school kids wonder how the two can possibly go together: couldn’t God have done something to save the children if he holds ultimate power? It’s not hard to imagine any number of things he could have done very discretely to alter the outcome. All loving and all powerful collide head on. The purpose of this chapter is to show that the contradictions pile on top of one another as more attributes of God are claimed. Attention is paid here especially to the concept of God the creator, because that itself begs too many questions. Left unsolved is where God came from, and what God is like. The Bible can’t be used to fill in the details because its concepts of God derive from Bronze Age thinkers and are inconsistent—even vile. Furthermore, even if we acknowledge that there was a creator God, then we would have the option of a good God, an evil God, a committee of Gods. Religious people have made arguments for all of these because they disagree fundamentally about the ways to know about God. Western monotheism, in its various manifestations, is burdened with improbabilities and silliness. As I show in detail, it is a train wreck in terms of logic, consistency and decency. Theologians have been speculating and guessing about God forever, but precious little consistency has been achieved in what they work out God to be and what he expects—and what he’s like. Prayer and worship are commonly added to the mix—but wait, how can it be than a supremely good, all-powerful, all-knowing God has to hear prayers to find out what’s going on and determine what to do? Why would God crave praise and worship—and welcome subservience? All of the ‘wonderful’ attributes of God claimed by believers add up to a big mess. 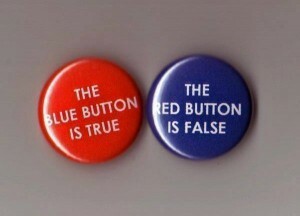 And theologians have been hard at work for centuries to explain away the contradictions and inconsistencies. How can you possibly imagine that the religion you were born into is the ONE TRUE faith? With this chapter we transition to a discussion of Christianity specifically, the focus of the next five chapters. Monotheism is the belief that there is one supreme God, yet Western monotheism itself is fractured, a clue that its lens on reality is clouded and defective. In what way, and how, does it capture truth about God? It represents religion off the rails. The purpose of this chapter is to hold Christian feet to the fire: those who are confident in their faith are obliged to explain how the other major monotheisms have it all wrong. It’s no good to say, “Oh well, we all worship the same God,” because even a cursory glance at Judaism, Christianity, Islam and Mormonism shows that this cannot possibly be the case. The concepts of God are radically different. 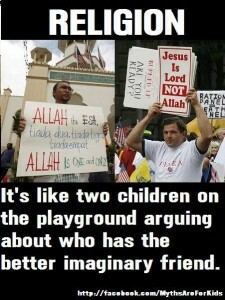 The violent disagreements among monotheists beg the question of who has it right. This only gets worse when we examine Christianity free of sentimentality and wishful thinking. According to one survey about a decade ago, done by a religious research group, there are now about 31,000 Christian denominations, divisions, factions, sects, cults and splinter groups: Christians cannot agree about God. They’ve gone to war and burnt dissenters at the stake, to crush rival versions of the faith. What does that tell us about so-called Christian truth? No one knows for sure what it is! The purpose of this section of the chapter is to demonstrate that this scandal of endless Christian division undermines its claim to any truth at all. The portraits of ‘the one true God’ offered by Judaism, Christianity, Islam and Mormonism differ substantially, and in some cases, radically. 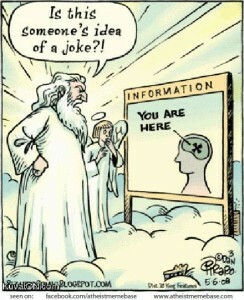 So which God is it? Who has corned the truth? Has anyone cornered the truth? Christians cannot retreat to the safe-haven of the superior Christian option, because there are now more than 31,000 different brands of Christianity: no one agrees on who’s right about God. Yet people are confident that the version of the faith that they were born into—or that they shopped round for—is the right faith, and that it will not end up on the scrap heap of history, as have all other religions that have lost popular appeal. The Holy Gospels? I don’t think so. 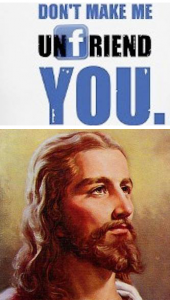 They don’t tell us very much about Jesus at all. For centuries, the very names of the gospels were taken as proof that they could be trusted, explicitly. Disciples of Jesus or their friends had been there, right from the start, to write things down. And, after all, aren’t the gospels the Word of God? But this naïve view crumbled as serious historical research on the gospels got under way a couple of centuries ago. Historians decided to subject the gospels to the same standards that they would apply to any other documents from the ancient world. 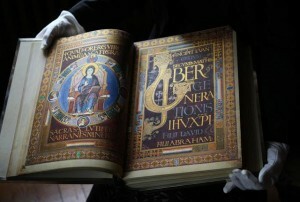 And it turned out that the gospels are not based on contemporary documentation, nor were they written by eyewitnesses. The names of the gospels, Matthew, Mark, Luke and John, were added later by pious tradition. The gospels themselves do not claim to be written by people on the scene. The purpose of this chapter is to demonstrate that the common Christian trust of the Jesus story in the New Testament is unwarranted. It is especially painful that the real words of Jesus are irretrievable. And by no means is this a radical conclusion; I present the case in this chapter that the process of recovering the true words of Jesus is fraught with difficulties. I suspect that many Christians come away from a careful reading of the gospels with more unease than they’re willing to admit; there is growing awareness that the gospels are highly suspect documents. I have the most fun in this chapter offering a detailed tour of the first chapter of each of the gospels. What an eye-opener! One of the scandals in New Testament scholarship is that highly trained scholars, by scrupulous analysis of the gospels, have come up with radically different portraits of Jesus. And this confusion holds among laypeople as well. People read the gospels and pick and choose nice verses to create—as one prominent New Testament scholar has put it—the “Jesus of their imaginations.” Thus an idealized Jesus has emerged in the popular imagination, and, using this as the standard, pious believers ask, “What would Jesus do?” But in this chapter I show that this question is impossible to answer—because the “real” Jesus is not within our grasp. The irony, indeed, the tragedy, is that most Christian laypeople remain unaware of the work of New Testament scholarship. The literature on the New Testament is vast beyond imagining—the bulk of it by religious scholars—and yet the common assumptions about Jesus and the faith remain untouched. Truly, in this case ignorance is bliss. The resurrection of Jesus is simply irrelevant. The resurrection of Jesus is the essential Christian dogma. Occasional liberal attempts to water it down are commonly met with derision: Christianity would not be Christianity if Jesus didn’t come back to life after his crucifixion. Atheist ridicule of the resurrection usually begins with science, i.e., resurrection is just one of many miracles on the Christian roster of tall tales, and can be summarily dismissed. But these arguments get us nowhere. The purpose of this chapter is the demonstration that the resurrection of Jesus is an epic failure precisely because the New Testament stories about the resurrection don’t work. 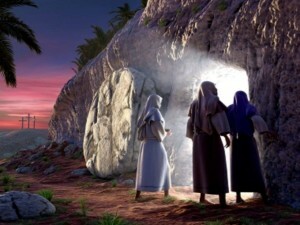 When the Empty Tomb stories are compared side by side, it is clear that legends have been layered upon legends. But the real kicker is that the apostle Paul, who is the earliest writer in the New Testament, knew nothing about an Empty Tomb story. Even more startling is his emphasis on spiritual bodies that Christians will inherit for enjoying eternal life. What is a spiritual body? We don’t have a clue what Paul meant by that—and, frankly, I suspect that he didn’t either. The body of Jesus coming back to life? The resurrection of a body that had gone into a tomb? Paul would have been considered the idea foolish. The Empty Tomb story, however, is dramatic and has endured more securely than anything else in Christian lore. There is a more fundamental problem: What impact would a body coming back to life for a few days, long go and far away in first century Palestine, have on people in general surviving physical death to go to heaven? It fails by all standards of logic. But this is a dogma imbedded deeply in accepted theological tradition, which people simply give their nods to, failing to apply standards of common sense. I don’t think it’s clever to talk down the resurrection by marshaling the scientific arguments. The New Testament itself provides all the evidence we need to show that it a tall tale that got out of hand; it is an empty stab at escaping death. Recap of Problem 7: Resurrection is a concept borrowed from pagan antiquity, rooted ultimately in the deep craving of humans for rescue from death. Resurrection folklore was grafted onto the story of Jesus, with no precedent whatever based on the Old Testament. The gospel stories of Jesus’ resurrection are clumsy and contradictory, and end with the lie that the body of Jesus floated away to heaven, out of sight through the clouds. The party line of the church is that this particular resurrection—defying all reason and logic—provides the magic to guarantee that those who believe in it will be granted eternal life: this is a regression to the original gimmick of escape from death. Human sacrifice: the horror at the center of Christianity. One of the ugly features of Biblical religion is its enthusiastic embrace of animal sacrifice. Of course, animal sacrifice is a vestige of ancient practice rooted in the idea that the gods were delighted by the aroma of burning flesh. Even in the time of Jesus, the primary industry of the Jerusalem Temple was the sale of animals for burnt offerings, which were required to atone for a wide variety of sins. Believers today claim that Christianity has outgrown this barbarism. But has it? Actually, it upped the ante, because it moved on to embrace human sacrifice. One of the constant themes of New Testament theology is that God required the sacrifice of his son to enable forgiveness of sins. The purpose of this chapter is to show that the New Testament incriminates itself by championing this concept. 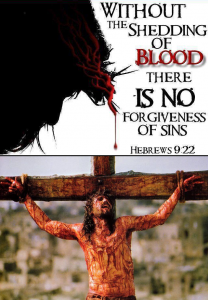 Christians are capable of stunning myopia in failing to grasp the ghastly truth about this sacrifice-theology. As Richard Dawkins has said, if an infinitely powerful and good God wants to forgive people, why not just forgive them? Why is the mechanism of a human sacrifice needed? The very symbol of Christianity has become the grotesque figure of a man nailed to a cross—some of the Catholic imagery is especially repellant—but Christian theology didn’t stop there. A pagan idea was grafted onto the Christian frame: eating the flesh and drinking the blood of a god had magical powers. The purpose of this part of the chapter is to show that this pagan idea in fact demeans Christianity. Even in the first century, Christians were accused of cannibalism when outsiders got wind of their practice of eating bread and drinking wine as symbols of their god’s body. Recap of Problem 8: From primitive eras of the human experience, sacrificing the blood of animals—offering their lives upon the altars—was a way to appease the anger of gods or simply to get on their good sides. This degrading religion was practiced at the time of Jesus in the Jerusalem Temple, and the grotesque theology behind it found safe harbor in the New Testament belief that God was no longer content with animal sacrifice. He had decreed that a human sacrifice, his own son, was now the only fit offering. Astonishingly, Christians are not fazed by this barbarity, but welcome and celebrate it. Jesus is overrated! How do we know? Just….read…the…gospels….duh. There is no doubt that the image of Jesus has become inflated, and that he is credited with far more goodness and niceness than a reading of the gospels warrants. The purpose of this chapter is to make the case that multiple negatives about Jesus are in full view in the gospels. Piety clouds Christian vision, and the faithful maneuver around the embarrassing verses. Chunks of the Jesus story are never read aloud in church or make it into the Sunday school lessons. In this chapter I cover ten categories of Jesus negatives, starting with his alarming pronouncement that hatred of one’s parents and family was a requirement for being one of his followers. He also seems to have been convinced that the Kingdom of God was soon to be initiated—this idyllic realm was to be lowered from heaven—and when it happened most of the people on the planet would be killed. He predicted that the suffering associated with his return would be worse than at the time of Noah’s flood, and that’s saying a lot; it was an unparalleled act of genocide. Recap of Problem 9: Even if all the overblown theology about Jesus is devalued and discounted—maybe we can just chuck all the stuff about virgin birth, son of god and resurrection—people are determined to overcompensate for the loss and rush to affirm that Jesus was a supremely good human being, a magnificent Galilean preacher who set the moral compass for humanity. Yet the gospels do not bear this out: the gospels display Jesus as a deeply flawed character who recommended hatred of family and whose expectations about a soon-to-dawn Kingdom of God were delusional. His moral teaching were derivative and in many cases inferior to those of other moral teachers. His reputation is based on highly selective recitations of texts, yet he is proclaimed the Prince of Peace, the Son of God. Paul’s letters should be ripped out of the New Testament. The letters of Paul are the hardest parts of the New Testament to plow through and make sense of. Most believers don’t even bother. Even his Letter to the Romans gets little traffic, and yet it is one of the charter documents of the Christian faith; more books have probably been written about it than any other text in Western literature. Martin Luther called it the most important book in the New Testament. While Paul’s letters are avoided or cherry-picked for his few ‘Hallmark” moments, the Book of Acts is good narrative. Paul gets pretty good press there, and in Acts we find the story of his dramatic conversation on the road to Damascus. In the wake of this he dropped his ferocious persecution of Christians and gave himself totally to the passionate preaching of Christ as the key to salvation: belief in the risen Christ was all that mattered to win a place in the Kingdom of God that was almost at hand. The purpose of this chapter is to show that Paul can fairly be called a delusional cult fanatic. Most Christians today would be repelled if they had to spend an afternoon with him. There are hints in his letters that people at the time felt the same way. Again, there is no trickery. I provide a tour of key passages from the authentic Paul letters, and show how the words delusion, cult and fanatic apply. And, as was the case with Jesus, it is easy to show that Paul was spectacularly wrong: his negativism about women and marriage was wrong; his belief that governments—all governments—were ordained by God was wrong; his super confidence that Jesus would soon return through the clouds from heaven—during his own lifetime—was wrong. The adoration of Paul among Christian theologians has been second only to the adoration of Jesus—and it is just as misplaced. But because Paul was so tireless in his preaching about Christ, because he wrote huge letters that, by an accident of history, achieved status as scripture, his influence has been enormous. It is one of the tough problems of Christianity that a man who was so wrong remains one of the major heroes of Christendom. Recap of Problem 10: Paul’s letters ended up as a major chunk of the New Testament and he is the hero of the Book of Acts. After Jesus, he is the most prominent star in the Christian firmament, and his stature has been affirmed by Christian fawning for two millennia. Yet he was wrong about almost everything. He never met Jesus and had no interest whatever in what the Galilean preacher had said and done. Jesus did not return in his lifetime as he assured everyone; his teachings about marriage are a joke; he urged that all government leaders have been appointed by God; and he preached obsessively about a magic formula—“just believe in the Risen Christ”—to win a seat in heaven. Humans have bungled religion so badly. Aliens would stay away. 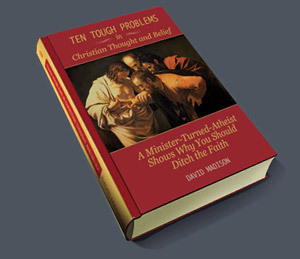 The purpose of the conclusion is to demonstrate beyond reasonable doubt—given the ten tough problems—that Christianity has been falsified as thoroughly as many other ideas that have commanded widespread respect and belief. I offer other examples of famous falsifications. What do I mean by “our reputation in the galaxy”? This might be called an adventure into the farfetched, but it is a thought experiment worth pursuing. Are there other thinking creatures ‘out there’? Is there a massive galactic social network beyond our imagining? Maybe the galactic powers-that-be monitor planets that achieve technological sophistication. If so, as Carl Sagan once speculated, they may have been snooping on humans for millennia and monitoring our progress. And what would they think of us? Surely our enthusiasm for war and destruction would be a mark against us. Civilizations that have survived twenty or fifty times longer than we have must have found ways to banish violence. What would be another mark against us? Intelligent beings from elsewhere, who may have been thinking about the Cosmos for hundred of thousands of years (we have been at it for about 5,000 years), might be utterly baffled by the human religion: thousands of gods have been imagined by humans—concocted by our mammalian brains—and worshipped with unaccountable fervor. One consequence has been unspeakable violence and bloodshed. 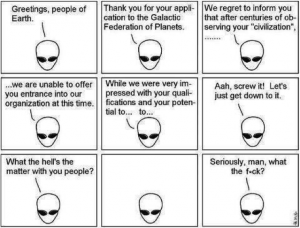 Maybe aliens don’t contact us—that is, they’re quite happy just to continue snooping—because we need to demonstrate our capacity for rational thought and behavior, and to live free of mythologies.